Aker University Hospital is a dingy place to heal. The floors are streaked and scratched. A light layer of dust coats the blood pressure monitors. A faint stench of urine and bleach wafts from a pile of soiled bedsheets dropped in a corner. Look closer, however, at a microscopic level, and this place is pristine. There is no sign of a dangerous and contagious staph infection that killed tens of thousands of patients in the most sophisticated hospitals of Europe, North America and Asia this year, soaring virtually unchecked. Twenty-five years ago, Norwegians were also losing their lives to this bacteria. But Norway's public health system fought back with an aggressive program that made it the most infection-free country in the world. A key part of that program was cutting back severely on the use of antibiotics. Now a spate of new studies from around the world prove that Norway's model can be replicated with extraordinary success, and public health experts are saying these deaths 19,000 in the U.S. each year alone, more than from AIDS are unnecessary. "It's a very sad situation that in some places so many are dying from this, because we have shown here in Norway that Methicillin-resistant Staphylococcus aureus (MRSA) can be controlled, and with not too much effort," said Jan Hendrik-Binder, Oslo's MRSA medical adviser. "But you have to take it seriously, you have to give it attention, and you must not give up." Now, in Norway's simple solution, there's a glimmer of hope. Dr. John Birger Haug shuffles down Aker's scuffed corridors, patting the pocket of his baggy white scrubs. "My bible," the infectious disease specialist says, pulling out a little red Antibiotic Guide that details this country's impressive MRSA solution. It's what's missing from this book an array of antibiotics that makes it so remarkable. "There are times I must show these golden rules to our doctors and tell them they cannot prescribe something, but our patients do not suffer more and our nation, as a result, is mostly infection free," he says. Norway's model is surprisingly straightforward. Norwegian doctors prescribe fewer antibiotics than any other country, so people do not have a chance to develop resistance to them. Patients with MRSA are isolated and medical staff who test positive stay at home. Doctors track each case of MRSA by its individual strain, interviewing patients about where they've been and who they've been with, testing anyone who has been in contact with them. Haug unlocks the dispensary, a small room lined with boxes of pills, bottles of syrups and tubes of ointment. What's here? Medicines considered obsolete in many developed countries. What's not? Some of the newest, most expensive antibiotics, which aren't even registered for use in Norway, "because if we have them here, doctors will use them," he says. He points to an antibiotic. "If I treated someone with an infection in Spain with this penicillin I would probably be thrown in jail," he says, "and rightly so because it's useless there." Norwegians are sanguine about their coughs and colds, toughing it out through low-grade infections. "We don't throw antibiotics at every person with a fever. We tell them to hang on, wait and see, and we give them a Tylenol to feel better," says Haug. "Penicillin is not a cough medicine," says the tissue packet on the desk of Norway's MRSA control director, Dr. Petter Elstrom. He recognizes his country is "unique in the world and best in the world" when it comes to MRSA. 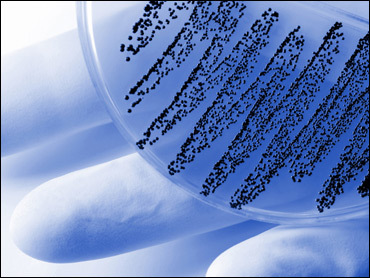 Less than 1 percent of health care providers are positive carriers of MRSA staph. But Elstrom worries about the bacteria slipping in through other countries. Last year almost every diagnosed case in Norway came from someone who had been abroad. "So far we've managed to contain it, but if we lose this, it will be a huge problem," he said. "To be very depressing about it, we might in some years be in a situation where MRSA is so endemic that we have to stop doing advanced surgeries, things like organ transplants, if we can't prevent infections. In the worst case scenario we are back to 1913, before we had antibiotics." Forty years ago, a new spectrum of antibiotics enchanted public health officials, quickly quelling one infection after another. In wealthier countries that could afford them, patients and providers came to depend on antibiotics. Trouble was, the more antibiotics are consumed, the more resistant bacteria develop. Norway responded swiftly to initial MRSA outbreaks in the 1980s by cutting antibiotic use. Thus while they got ahead of the infection, the rest of the world fell behind. In Norway, MRSA has accounted for less than 1 percent of staph infections for years. That compares to 80 percent in Japan, the world leader in MRSA; 44 percent in Israel; and 38 percent in Greece. In the U.S., cases have soared and MRSA cost $6 billion last year. Rates have gone up from 2 percent in 1974 to 63 percent in 2004. And in the United Kingdom, they rose from about 2 percent in the early 1990s to about 45 percent, although an aggressive control program is now starting to work. About 1 percent of people in developed countries carry MRSA on their skin. Usually harmless, the bacteria can be deadly when they enter a body, often through a scratch. MRSA spreads rapidly in hospitals where sick people are more vulnerable, but there have been outbreaks in prisons, gyms, even on beaches. When dormant, the bacteria are easily detected by a quick nasal swab and destroyed by antibiotics. Dr. John Jernigan at the U.S. Centers for Disease Control and Prevention said they incorporate some of Norway's solutions in varying degrees, and his agency "requires hospitals to move the needle, to show improvement, and if they don't show improvement they need to do more." "Nobody is accountable to our recommendations," he said, "but I assume hospitals and institutions are interested in doing the right thing." Dr. Barry Farr, a retired epidemiologist who watched a successful MRSA control program launched 30 years ago at the University of Virginia's hospitals, blamed the CDC for clinging to past beliefs that hand washing is the best way to stop the spread of infections like MRSA. He says it's time to add screening and isolation methods to their controls. The CDC needs to "eat a little crow and say, 'Yeah, it does work,"' he said. "There's example after example. We don't need another study. We need somebody to just do the right thing." But can Norway's program really work elsewhere? The answer lies in the busy laboratory of an aging little public hospital about 100 miles outside of London. It's here that microbiologist Dr. Lynne Liebowitz got tired of seeing the stunningly low Nordic MRSA rates while facing her own burgeoning cases. So she turned Queen Elizabeth Hospital in Kings Lynn into a petri dish, asking doctors to almost completely stop using two antibiotics known for provoking MRSA infections. One month later, the results were in: MRSA rates were tumbling. And they've continued to plummet. Five years ago, the hospital had 47 MRSA bloodstream infections. This year they've had one. "I was shocked, shocked," says Liebowitz, bouncing onto her toes and grinning as colleagues nearby drip blood onto slides and peer through microscopes in the hospital laboratory. When word spread of her success, Liebowitz's phone began to ring. So far she has replicated her experiment at four other hospitals, all with the same dramatic results. "It's really very upsetting that some patients are dying from infections which could be prevented," she says. "It's wrong." Around the world, various medical providers have also successfully adapted Norway's program with encouraging results. A medical center in Billings, Mont., cut MRSA infections by 89 percent by increasing screening, isolating patients and making all staff not just doctors responsible for increasing hygiene. In Japan, with its cutting-edge technology and modern hospitals, about 17,000 people die from MRSA every year. Dr. Satoshi Hori, chief infection control doctor at Juntendo University Hospital in Tokyo, says doctors overprescribe antibiotics because they are given financial incentives to push drugs on patients. Hori now limits antibiotics only to patients who really need them and screens and isolates high-risk patients. So far his hospital has cut the number of MRSA cases by two-thirds. In 2001, the CDC approached a Veterans Affairs hospital in Pittsburgh about conducting a small test program. It started in one unit, and within four years, the entire hospital was screening everyone who came through the door for MRSA. The result: an 80 percent decrease in MRSA infections. The program has now been expanded to all 153 VA hospitals, resulting in a 50 percent drop in MRSA bloodstream infections, said Dr. Robert Muder, chief of infectious diseases at the VA Pittsburgh Healthcare System. "It's kind of a no-brainer," he said. "You save people pain, you save people the work of taking care of them, you save money, you save lives and you can export what you learn to other hospital-acquired infections." Pittsburgh's program has prompted all other major hospital-acquired infections to plummet as well, saving roughly $1 million a year. "So, how do you pay for it?" Muder asked. "Well, we just don't pay for MRSA infections, that's all." Beth Reimer of Batavia, Ill., became an advocate for MRSA precautions after her 5-week-old daughter Madeline caught a cold that took a fatal turn. One day her beautiful baby had the sniffles. The next? "She wasn't breathing. She was limp," the mother recalled. "Something was terribly wrong." MRSA had invaded her little lungs. The antibiotics were useless. Maddie struggled to breathe, swallow, survive, for two weeks. "For me to sit and watch Madeline pass away from such an aggressive form of something, to watch her fight for her little life it was too much," Reimer said. Since Madeline's death, Reimer has become outspoken about the need for better precautions, pushing for methods successfully used in Norway. She's stunned, she said, that anyone disputes the need for change. "Why are they fighting for this not to take place?" she said.